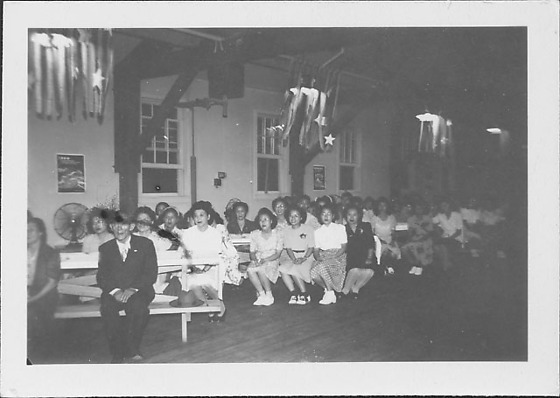 Large audience of predominantly women sit indoors as for performance or ceremony on benches placed at an angle to wall, from BL to CR of image, under lights covered with stars and streamers at Rohwer concentration camp, Rohwer, Arkansas, 1942-1945. An elderly man sits on the frontmost bench, L, with his hat next to him; his face is obscured by a black mark, probably on original negative. Open windows in background. Opposite to 97.292.13G.